Capital of the most populated canton (state) within the whole of Switzerland, Zurich is famous for being a major centre of finance and many of the world's leading banks are gathered here. However, in recent years Zurich has enjoyed a period of change, ditching its rather staid appearance associated with banking, and adopting a more vibrant and exciting atmosphere, with a wealth of trendy eateries and shops. The Street Parade each August is a definite summer highlight and has become one of Switzerland's premier carnivals, with endless floats. 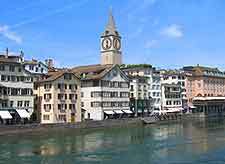 Based around both Lake Zurich (Zürichsee) and the Limmat River, the city boasts a strong Mediterranean character and whilst it can appear a little noisy and brash, the Bahnhofstrasse shopping mile next to the River Sihl exudes elegance and style, and is home to many interesting galleries. Inside of the main hall of the train station, the office of Zürich Tourism offers everything that you could possibly need when it comes to tourist information and provides a small map of the city free of charge. This is also a good place to purchase your Zurich Card, which offers sizable savings for sightseeing and travel when well used and is valid for either 24 or 72 hours. Start your sightseeing by taking a walking tour of the appealing Old Town area, which is known locally in Zurich as the Altstadtbummel and filled with interest. The summer months are the perfect time to visit the city and many people make the most of this fine weather by enjoying a relaxing cruise along the Limmat River or on Lake Zurich, or even hiring a pedalo and join in the waterside fun around the lake's popular beach resort of Strandbad Mythenquai. Alternatively, head to the Sprüngli Factory and enjoy some of the finest Belgian chocolates ever created. 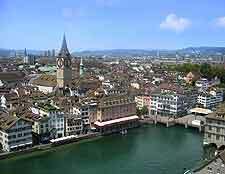 More information about Zurich Tourist Attractions. When it come to historic landmarks, Zurich has them in abundance, although few come more impressive than the Fraumünster Cathedral, which dominates the Münsterplatz with its towering single spire and stands across the Limmat from the larger and even grander twin-spired Grossmünster Cathedral. Positively ancient and known to date back to the 11th century, the Kyburg Castle (Schloss Kyburg) is today used for regular exhibitions and functions rather like a museum. Something a little more natural but equally imposing in Zurich is the Käferberg Mountain, which offers a pleasant backdrop to much of the city, along with walking trails and splendid panoramas. 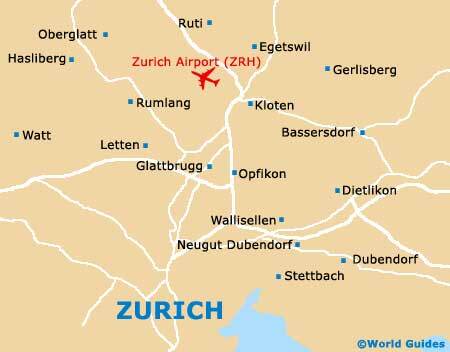 More information about Zurich Landmarks. If you crave a little more information about the country, then head to the Swiss National Museum, where you will be taken back through history, from prehistoric times onwards. Being a university city, Zurich features a number of excellent university museums, where the entrance is completely free. These include both the Ethnology Museum and the Zoological Museum, the latter of which can be reached by taking a scenic and rather enjoyable trip on the Polybahn funicular railway. The art scene in Zurich is also well developed, with highlights including the Löwenbräu Complex and the Kunsthaus (Museum of Fine Arts), where the largest collection of fine art in Switzerland actually resides. 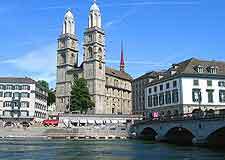 More information about Zurich Museums and Zurich Art Galleries. 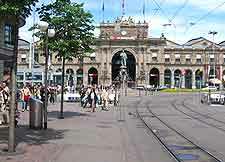 Many tourists choose to use Zurich as a base for day trips and close by are many of Switzerland's biggest and most popular cities. The medieval Swiss capital of Berne is to the south-west, close to both France and Germany, and is listed as a World Heritage Site, while to the west and based around the River Rhine is the city of Basel, which is regarded as nothing short of a European Capital of Culture. Lucerne is also close to Zurich and is where you will find Europe's most historic wooden bridge, the Kapellbrücke (Chapel Bridge), built in the 14th century to span the River Reuss. 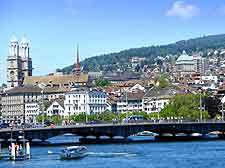 More information about Zurich Attractions Nearby.